A Solar Energy Seminar – the first of its kind – was held in Botswana in early February. 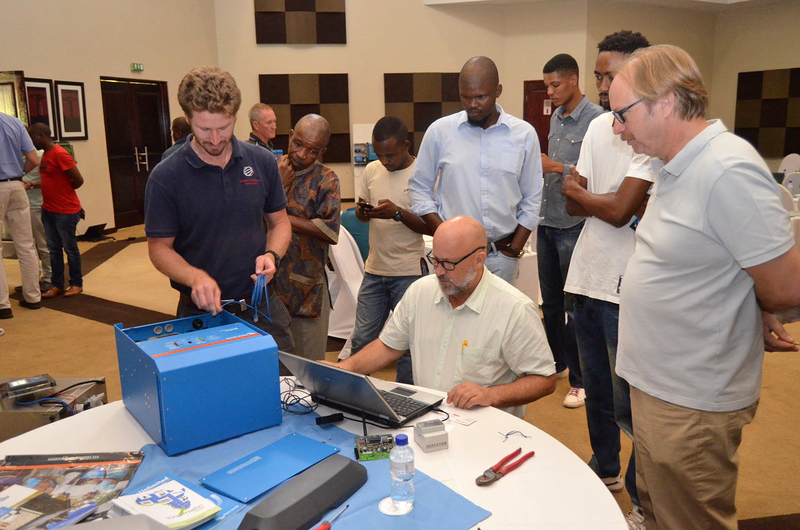 Hosted by Victron’s Andre du Rand, some of it’s 36 delegates – engineers, installers and members of Solar Industries Association of Botswana – travelled hundreds of kilometres to learn how to program, configure, and install solar-energy systems. The continent has huge potential for us …under African skies where grid electricity is by no means widely available. 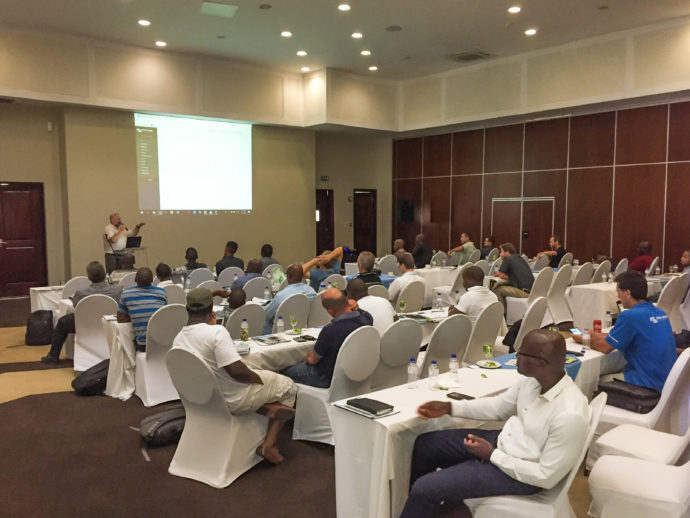 Emphasising Off-Grid solutions, the seminar show-cased the new ‘Smart’ range of Victron products with a demonstration of how they can be controlled using VictronConnect. 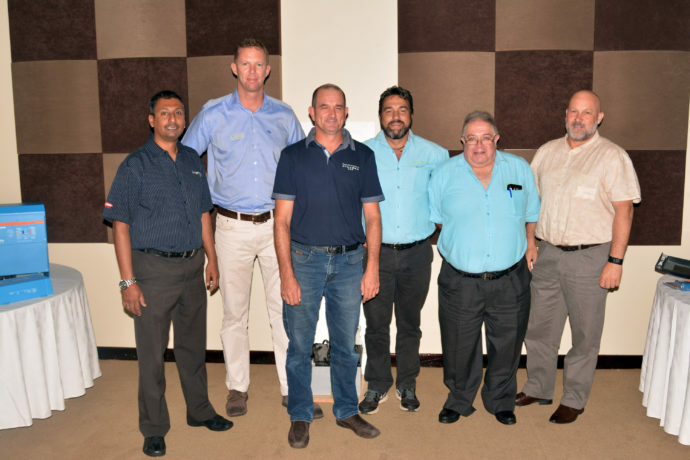 From left to right: Anesh Lahka; Andre du Rand; Gavin Hobson; James Frank; Mike Kirby; James Venter. Attendees received a well-rounded and informative presentation due to the efforts of speakers from several organisations: Age Technologies (combiner boxes/system balancing); Innomatic Solar (Fronius distributor); Bluenova (Energy Storage Manufacturer) and Freedomwon (Lithium storage for car/home)- together with Andre Harrison – who as a Victron Authorized Installer has plenty of experience from the coal face. 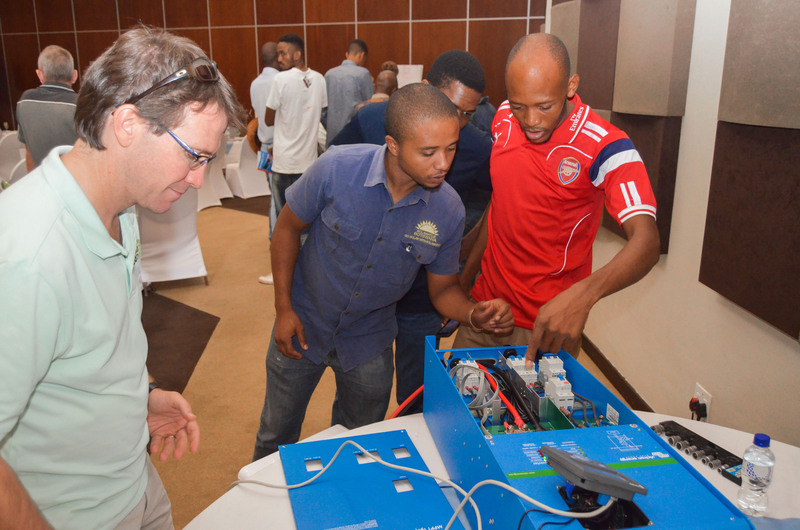 With all that expertise on hand attendees gained a good understanding of the potential of remote power installations with Lithium(LiFePo4) battery integration (design and safety instruction); Surge protection; and AC/DC combiner boxes for large-scale arrays. On the second day the training was extended to include grid-tie self-consumption systems, and to demonstrate the neat features of the CCGX – such as Generator auto Start/Stop. Training workshops were then available to individuals or groups with specific queries. Following on from the success of the event Andre du Rand is planning a Large Systems seminar later this year. Africa: Distributor meeting, solar show, training and dancing!